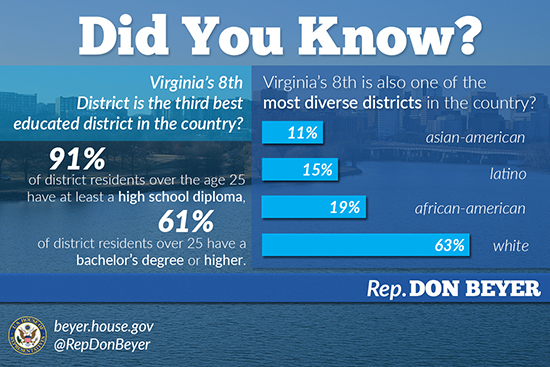 I am honored to serve the residents of the 8th Congressional District of Virginia. Virginia's 8th Congressional District is the heart of Northern Virginia, encompassing Arlington County, the Cities of Alexandria and Falls Church, and portions of Fairfax County. 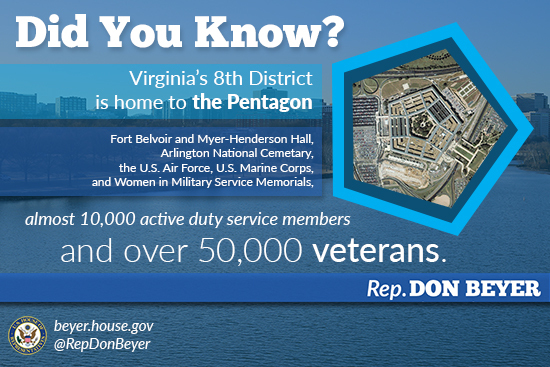 Right across the Potomac River from the nation's capital, the 8th District is home to many national memorials including Arlington National Cemetery, the Iwo Jima Memorial, and the new Air Force Memorial. Located in one of the fastest growing regions of the country, the 8th District is home to a booming high-tech sector. The federal government and government contractors are among the district's largest employers. Our residents are some of the best educated, modern, and ethnically diverse in the Commonwealth of Virginia, and the 8th is one of the best places in the country to live, work, and visit. The region boasts a wealth of education, career, and recreational opportunities. Unemployment is among the lowest in the nation and the area is a job magnet for new college graduates. George Washington Memorial Parkway winds its way through nearly the entire 8th District, offering pristine views of the Potomac River, Mount Vernon, Old Town Alexandria, and the heart of Arlington’s business community in Rosslyn and the cityscape across the river. Northern Virginia residents spend their free time on our miles of hiking and biking trails, at our world class restaurants, or enjoying a walk through one of our pedestrian friendly urban shopping centers. To find my District Office contact information, you can view my Offices page. If you would like to email me, you can send me a message using the form on my contact page. I hope you will sign up for my eNewsletter, follow me on Facebook, Twitter, and Instagram to learn more about the 8th District.